I warned you earlier against using "light stuff" to make openings or to set up opponents. I stressed that you took just as much of a gamble when you tapped an opponent with a left jab as when you hit him with a left jolt that might knock him down. 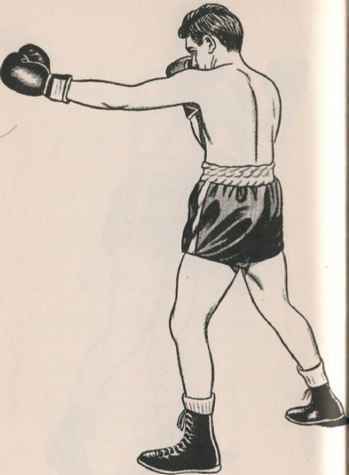 Any time you extend your left fist to an opponent's head for a tap or for a jolt you may be countered with a left jab, a right cross, or hooks on slips to the body. Note also that there's a big difference between making an opening and setting up an opponent. When you make an opening you merely cause an opponent to uncover a target somewhere on his person. But when you set up an opponent, you knock him off balance with one punch so that he should be an open target for a following punch. Unless he's knocked off balance, he's not set up. And you do not necessarily set up an opponent by landing a light left jab on his face or forehead. Many an experienced fighter will let a light jabber land several lefts on his face. The experienced fighter will not be set up by those jabs. Instead, he'll merely be getting ready to go boom! on the light-jabber's jaw. He'll be "sucking him in." Instead of using light stuff, you (1) make openings by feinting and by drawing, and (2) set up opponents by landing explosive jolts that knock them back on their heels. A feint is a threatened or faked punch that is not delivered. A draw is a faked opening left for your opponent to punch at, so that when he punches he will leave an opening at which you can counter. HOW IS THE FEINT USED? The feint generally is used to create an opening, although it can be used either to prevent an opponent from punching when he's set, or to draw an opponent into punching. 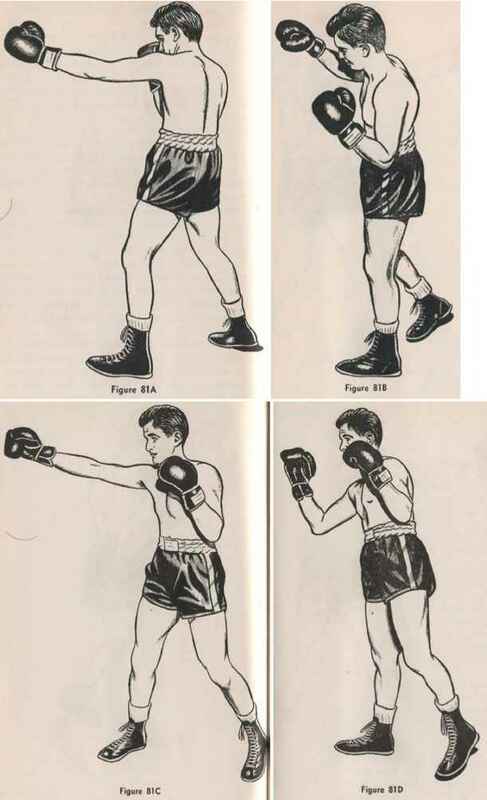 To create an opening, you threaten a punch by making a telegraph with the fist, shoulder, knee, foot or eyes. For example, if you wish your opponent to uncover his chin by dropping his guard, you might make a slight jabbing motion with your left hand toward his body. Or, you might make a slight roll with your left shoulder toward his body. Or, you might suddenly shift your eyes to his body. Yes, so slight a telegraph as an eye-shift can sometimes cause an opponent to punch. If you wish to "open" your opponent's body, you do your feinting at his head. Some fighters feint with the left foot. They smack the left foot down as if stepping. You shouldn't do that. It's dangerous to foot-feint, for when you lift the left foot you disturb your body-weight and your punching position. When feinting with your hands, particularly for the body, be careful not to extend the hand too far out or too far down. Such extensions will leave your head unguarded. SHOULDER FEINTS ARE THE SAFEST AND BEST. With practice, you'll discover that you can feint an opponent into making any number of moves. You can feint him into slipping, so that he'll be a target for a shovel. You can feint him into bobbing toward an uppercut. And you can feint him into disclosing what defense he will use against any particular blow. When you become an expert feinter, you can force an opponent into fighting your fight. You can induce him to make moves that will open him up-moves that will disclose whether he will block, parry or slip a punch; moves that will prevent his punching when he's set; moves that will prevent you from wasting punches and leaving needless openings. How is a "draw" used? You draw an opponent into punching at you by leaving an intentional opening. It is a faked opening because you not only are aware of the gap but you are prepared to counter your opponent before he can take advantage of the opening. For example, you can draw your opponent's left jab by carrying your right hand so low that your chin will be exposed. You know you are exposed, but you are set to counter with a right cross or with a slipping body hook at the split-second he starts his jab. Similarly, you can draw a straight right lead by dropping your left hand. Or, you can raise an elbow on either side to draw a lead to the body. You can drop a hand or raise and elbow in feinting and draw him into punching at the opening. But make certain that your draw doesn't boomerang on you-that you don't get hit instead of your opponent. In connection with faking, I'll tell you about an attacking combination that may prove useful. It is called the "double shift." It's for use against a retreating opponent. You do the double shift like this (Figure 81 A, B, C, D, E): Telegraph that you are about to shoot a straight left at your opponent's head. Shoot the left, which he'll evade by stepping back. Then, immediately stride forward with your right foot, and (as you stride) shoot a straight right at the head. If he's fast, he'll avoid that one too, but narrowly. Then, immediately stride forward with your left foot and (as you } stride) shoot a straight left at his head. Put everything you've got into that left, for it's almost sure to nail him. The double shift is designed to force a retreating opponent to (1) step back from the first left, and (2) immediately spring away frantically to avoid the unorthodox right that should (3) leave him flustered and unprepared to avoid the final unorthodox left. It is called the "double shift" because your body is shifting to the southpaw stance as you throw the right and shifting back to the normal stance as you shoot the last left. The combination of movements should be made with utmost speed and savagery-with your fists going whoosh! -whoosh!-BOOM! Even if you miss him with the last left, you'll be back in normal punching position, ready to work on an opponent who should be extremely flustered. Some fighters use the double shift with hooks instead of straight punches. The late Stanley Ketchel, a "wild man" slugger, used the shift with overhand swings, landing on the side of an opponent's jaw and neck with thumb-knuckle and wrist. Stanley must have had cast-iron hands. I would advise you not to attempt the double shift with hooks, for your long strides will open the hooks into swings or semi-swings. Moreover, use of the hooks will leave you dangerously open as your body turns at the beginning of each shift.